Over the past decade, Jordan has pursued structural reforms in education and health, as well as privatisation and liberalisation. The government of Jordan has introduced social protection systems and reformed subsidies, creating the conditions for public-private partnerships in infrastructure and making tax reforms. 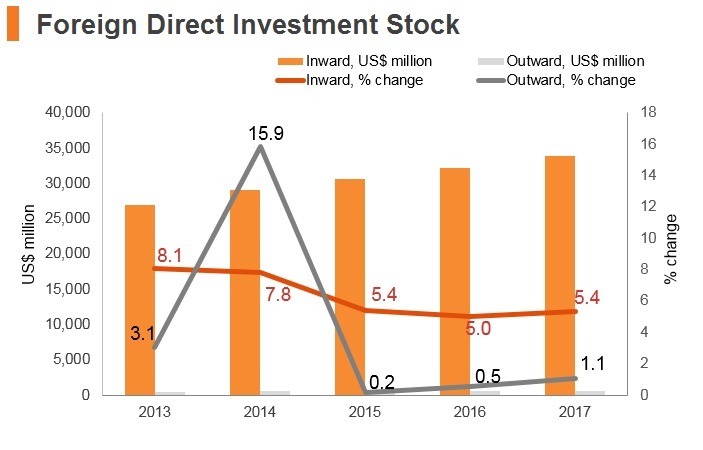 Foreign direct investment (FDI) represents nearly 90% of GDP, second in the region only to Lebanon, and a key indicator of how important foreign investment is for driving Jordan's economic growth. 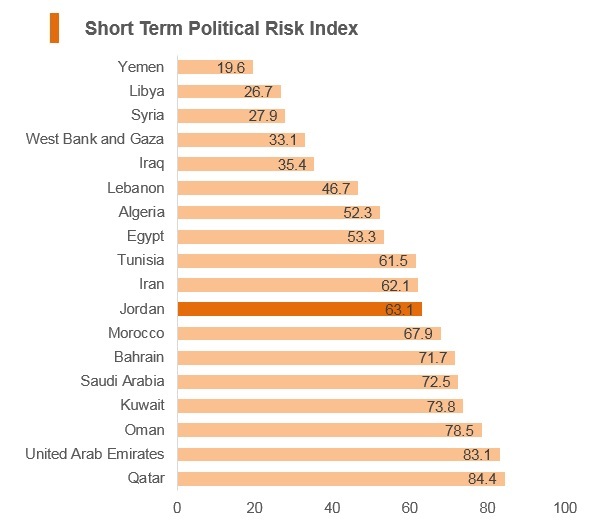 Given the significant regional insecurity stemming from neighbouring Syria's ongoing civil war, Jordan has been affected through the influx of refugees, a disruption of trade routes and lower investments and tourism inflows. 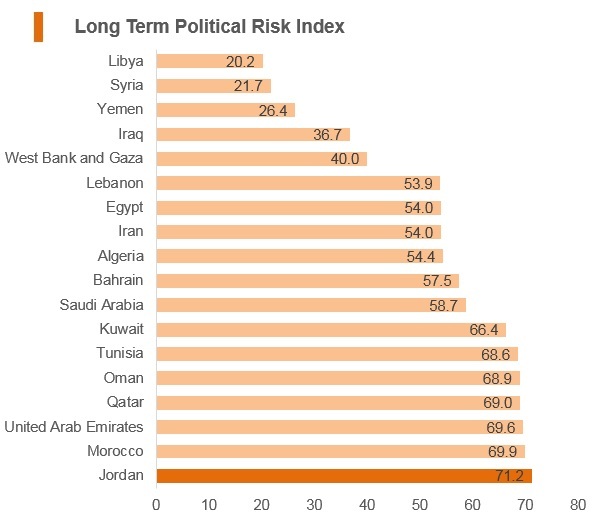 Other major challenges facing Jordan include high unemployment, a dependency on grants and remittances from Jordanians working in the Gulf economies as well as continued pressure on natural resources (particularly water). 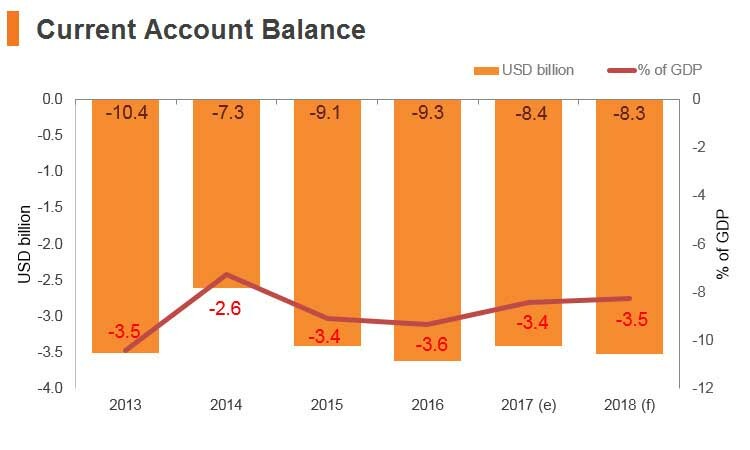 It remains critical for Jordan to continue diversifying its energy supply in the medium term in order to reduce its macroeconomic vulnerabilities. Further sound economic policies and growth-enhancing reforms will also be necessary to reduce the country's sensitivity to external shocks. 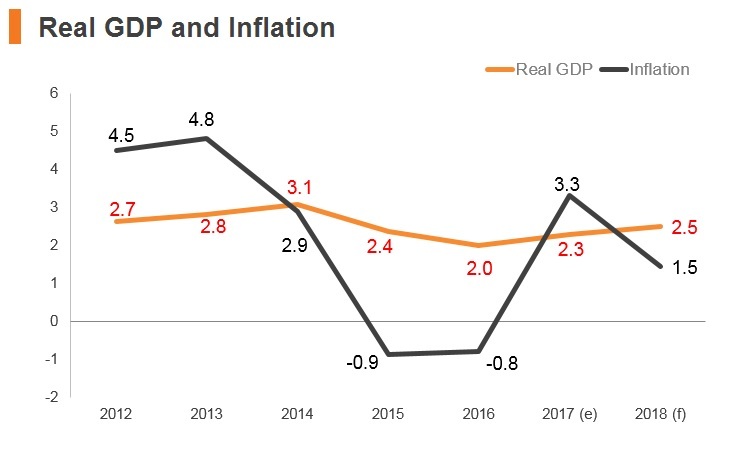 Finally, creating conditions for increased private investment and improved competitiveness will remain indispensable for Jordan to stimulate job-creating growth. First parliamentary elections held under proportional representation since 1989. Jordan and Iraq reopened their main border crossing for the first time in two years. Prime Minister Hani Mulki was replaced with the education minister and economist, Omar al-Razzaz. The Free Trade Agreements (FTAs) signed by Jordan are slowly reducing the weighted average applied tariff rate, which currently stands at a regionally average 4%. 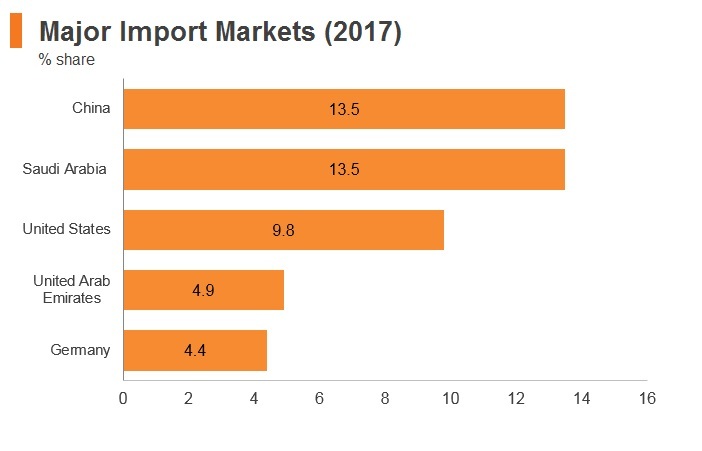 Import tariffs remain considerable for goods arriving from states not covered by FTAs, particularly for foodstuffs, clothing and other manufactured products. Beverages and tobacco face the highest tariffs, of up to 81.3%, with the next-highest duties dropping to 19.7% for fruits and vegetables. Jordan joined the World Trade Organisation (WTO) in April 2000, and has been pursuing an open trade regime. 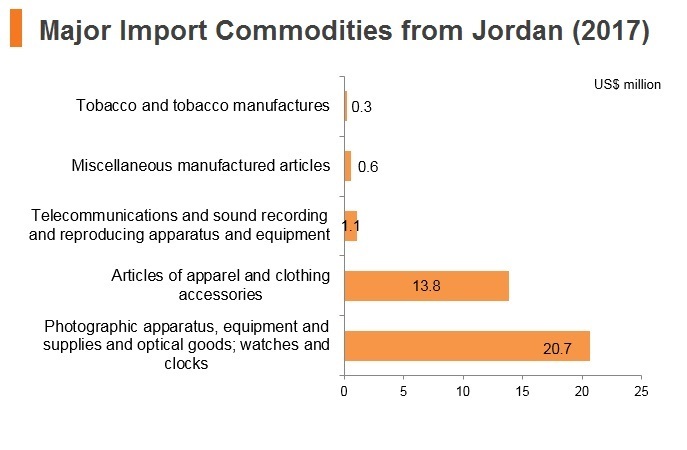 Jordan has bound its MFN tariffs on almost all products and tariffs are levied on an ad valorem basis. The applied MFN tariffs generally range between 0% and 30%, but some products, such as lighters, tobacco products, alcohol, and alcoholic beverages face a tariff up to 200%. Jordan has reduced its simple average applied MFN tariff rate from 14.7% in 2000 to 10.2% in 2014, with average rates of 17.4% for agricultural products (WTO definition) and 8.9% for non-agricultural products. Customs duties are assessed on the basis of the c.i.f. value of imports on the registration date of the customs valuation form. 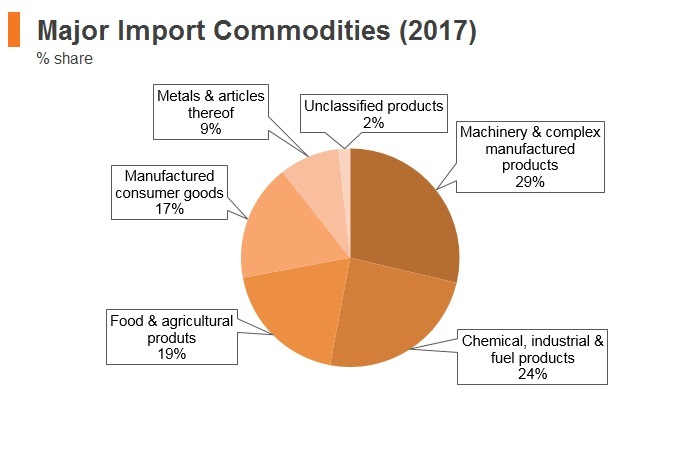 In 2015, there were 6,767 tariff lines in Jordan's applied MFN tariffs, out of which 33.7% of agricultural products and 56.4% of non-agricultural products were duty-free. Imports of some agricultural goods remain subject to additional licensing requirements, adding to the bureaucratic burden; however, a number of reforms, including fewer physical inspections of traded goods and the introduction of online customs services, have reduced non-tariff barriers for importers and exporters. This is indicative of continuing improvements to Jordan's operating environment for businesses engaged in international trade. 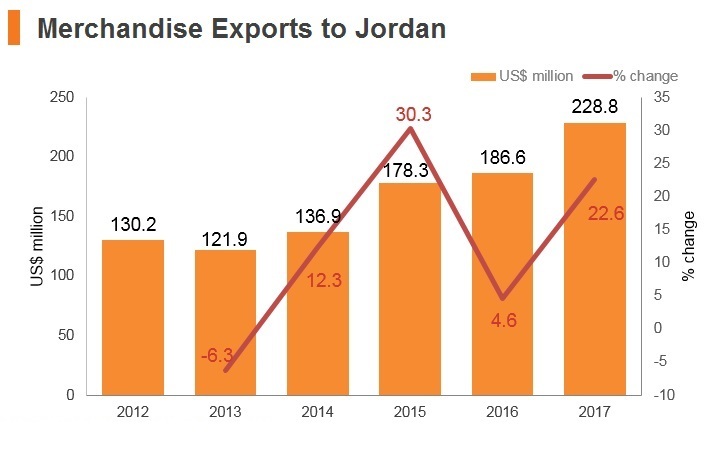 Logistics and security issues will also continue to hamper Jordan's cross-border trade in the short term. The Jordanian government has worked to reduce the burden of bureaucracy and other-non tariff barriers for importers. Customs regulations have been standardised and streamlined to improve efficiency. Companies seeking to import must obtain an importers card from the Ministry of Industry and Trade in order to clear customs. Import licenses are not required for most goods, with a few exceptions, including telecommunications equipment and some processed food products. Sanitary requirements and technical inspections can cause delays for food imports. With the challenges to Middle East and European countries as a result of the Syrian refugee crisis, the European Union (EU) is engaging in deeper diplomatic and trade cooperation with Jordan. In 2016, the EU committed to increasing aid to Jordan and easing rules of origin for Jordanian goods emanating from companies located in the country's special industrial estates and development zones that employ Jordanians and a minimum proportion of Syrian refugees. This allows products with a minimum Jordanian content of 30% to enter the EU under the EU-Jordan FTA over the next 10 years. 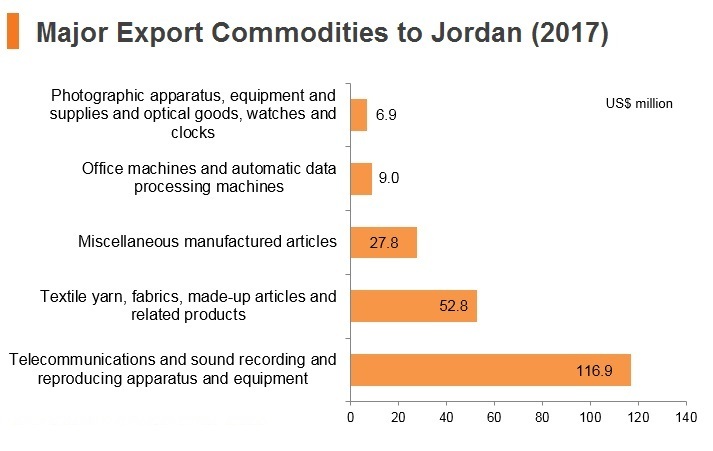 Such change offers positive long-term prospects for Jordan's exports to the European market. Jordan has not applied anti-dumping measures or countervailing duties, though safeguard measures are in place. Jordan has signed preferential trade treaties, including a number of FTAs with its major trading partners. In 1997, Jordan, the United States and Israel reached an agreement on establishing “Qualified Industrial Zones” (QIZs) in Jordan. QIZs are designated areas where manufactured products in the zones enjoy duty-free access to the United States market with no quota limit, provided that specific requirements on the rule of origins have been satisfied. 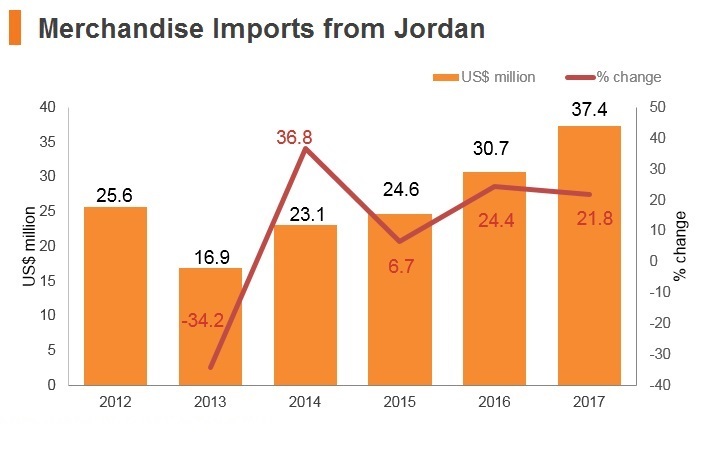 Importance of QIZs has declined in the wake of the Jordan-United States FTA concluded in 2001, under which qualified Jordanian goods entering the United States market are both duty- and quota-free. In recent years, Jordan has further opened up its economy to attract FDI. The Investment Promotion Law provides tax exemption on fixed assets from foreign investors for three years and duty-free import of raw materials into Jordan. Border Closures: Regional instability, including the civil war in Syria and the expansion of Islamic State (IS) in Iraq has resulted in border closures which have significantly disrupted international trade. Overland supply chain routes to trade partners in the Middle East have been cut off, and access to the Iraqi market, in particular, has been restricted since 2014. The border crossing with Iraq reopened in 2017 following the removal of IS militants from the border province of Anbar, which will ease trade flows somewhat. Instability in neighbouring states has forced Jordan to seek other markets for its exports, and this endeavour has been facilitated by the government's commitment to free trade and proactive seeking of numerous FTAs. Jordan has signed a number of important agreements with major economies and key trade partners. Jordan also has bilateral investment treaties (BITs) in force with 48 countries and signed BITs with a further nine that are not yet in force. Greater Arab Free Trade Area (GAFTA), comprising: Algeria, Bahrain, Egypt, Iraq, Jordan, Kuwait, Lebanon, Libya, Morocco, Oman, Palestine, Qatar, Saudi Arabia, Sudan, Syria, Tunisia, United Arab Emirates (UAE) and Yemen. GAFTA was declared within the Social and Economic Council of the Arab League as an executive program to activate the Trade Facilitation and Development Agreement that has been in force since January 1, 1998. Trade liberalisation is of great benefit to all member states and reduces the cost of imports to Jordan. However, regional instability and domestic security concerns has diminished the effect of this agreement and created security-related trade barriers. Bilateral FTAs between Jordan and non-MENA countries also have largely superseded this agreement. United States-Jordan FTA and Economic Integration Agreement: Jordan has benefitted considerably from its extensive economic partnership with the US through a comprehensive FTA that entered into force on December 17, 2001. 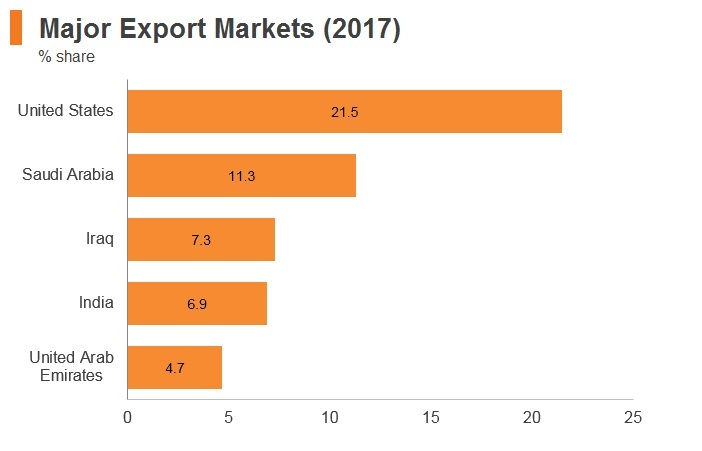 The United States is the country's top export partner and the agreement has facilitated significant United States investment in higher value-added industries, such as textiles manufacturing. Jordan-EU FTA: Jordan and the EU signed an association agreement that entered into force in May 2002 as part of the EU's efforts to enhance Mediterranean trade. The FTA covers trade in industrial products, as well as fish and marine products and processed agricultural products. Among the objectives of the Agreement are to promote, through the expansion of reciprocal trade, the harmonious development of economic relations. By 2014, virtually all customs duties on trade in industrial goods and fish and other marine products were eliminated. Medium-term growth is, therefore, expected in trade volumes between Jordan and this important bloc. Jordan-The European Free Trade Association (EFTA) FTA: The EFTA consists of Switzerland, Norway, Iceland and Liechtenstein, and its FTA with Jordan, covers trade in goods and entered into force on September 1, 2002. 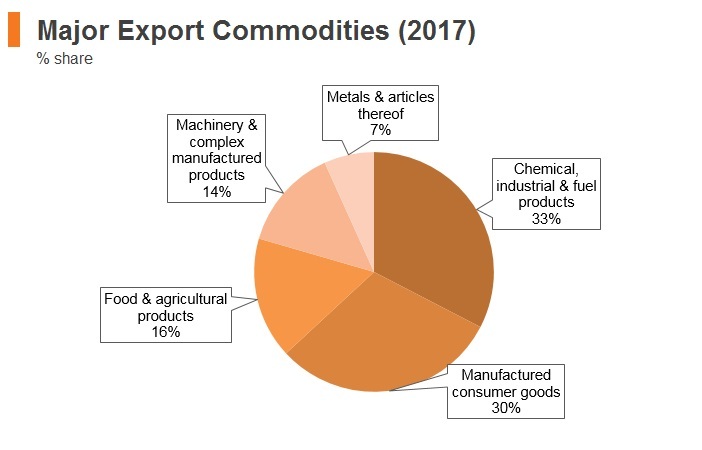 Jordan-Turkey FTA: Turkey is an important trade partner for Jordan, providing a key market for phosphate and fertilizer exports, as well as a source of refined fuel. Though trade flows have been disrupted by regional instability, economic ties between the two countries remain strong. Jordan also has FTAs and Economic Integration Agreements with Singapore (August 22, 2005) and Canada (October 1, 2012). Although these agreements will assist with trade diversification, overall trade flows with both countries remain low compared to other FTA partners. Jordan-Agadir Agreement: The FTA between Egypt, Jordan, Morocco and Tunisia (Agadir Agreement), is an FTA for trade in goods that entered into force on March 27, 2007. Pan-Arab Free Trade Area (PAFTA): Jordan is a member of the PAFTA Treaty, with members including: Egypt, UAE, Bahrain, Tunisia, Saudi Arabia, Sudan, Syria, Iraq, Oman, Palestine, Qatar, Kuwait, Lebanon, Libya, Morocco and Yemen. The Agreement is an FTA for trade in goods and entered into force on January 1, 1998. The Jordanian government has also attempted to channel FDI into certain priority sectors through legislative programmes and the Jordan Investment Commission (JIC). Jordan's Investment Promotion Law of 1995 (amended in 2000) and Investment Law No. 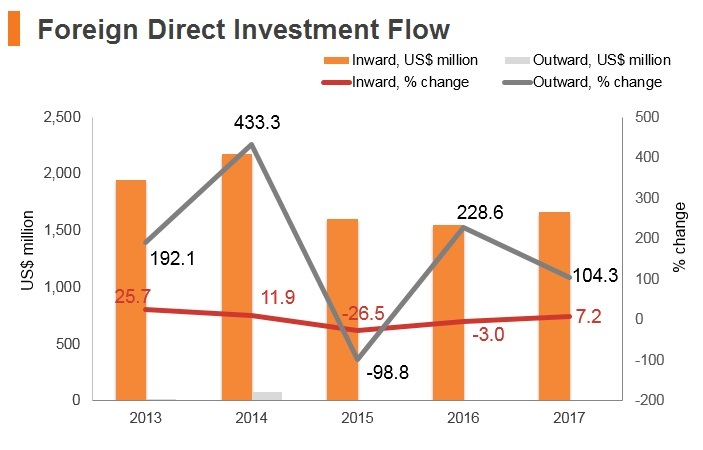 30 in 2014 includes provisions for attracting FDI, as well as domestic investment, and covers many sectors, including agriculture, industry, tourism, infrastructure, utilities and R&D. Although a minimum non-Jordanian investment requirement of USD70,000 (or JOD50,000) is imposed, foreign investors in these sectors will be eligible for a number of incentives. These may include exemptions from applicable customs duties and taxes on capital goods, imported spare parts, furniture for hotels and hospitals, and salaries paid to non-Jordanian employees. The level of exemptions provided depends on the geographic location of the investment, with the country divided into three investment zones: A, B, and C, representing the most developed (Zone A) to the least developed (Zone C) areas of Jordan. Reductions and exemptions from applicable taxes and duties are available for 10 years at 25% for Zone A, 50% for Zone B and 75% for Zone C.
The only sector in which foreign participation is entirely banned, is newspaper publishing, though foreigners are generally also prohibited from partial or complete ownership of security services, sports clubs, stone quarrying, customs clearance or road-based transportation. Approval for foreign investment in these sectors may be gained on a case-by-case basis, however, with the requirements that the project contribute significantly to the economy and create a large number of local jobs. 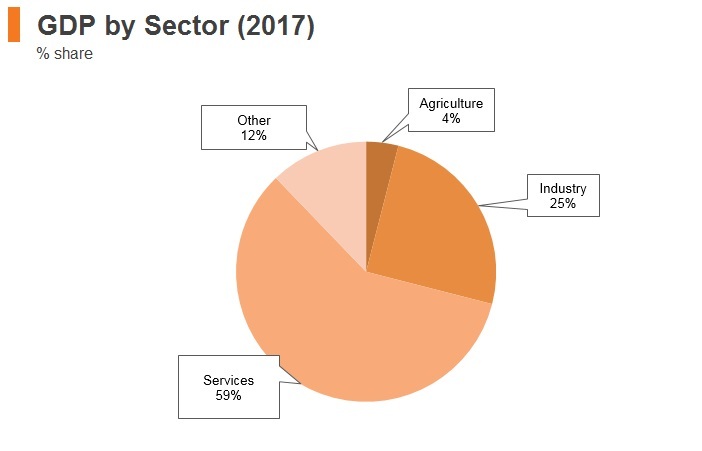 Caps on foreign ownership also exist in a number of other sectors, notably in transportation, retail, and engineering, advertising and hospitality services. A number of restrictions were lifted following the signing of the FTA with the United States in 2000, including in the telecommunications, tourism, health and services sectors. State-owned enterprises (SOEs) maintain a dominant presence in some areas of the economy, but do not pose a major barrier to foreign entry, and there are no significant local content requirements which puts foreign investors at a disadvantage. Foreign ownership is capped at 50% for enterprises in wholesale and retail trade, engineering and construction services, advertising, money exchange, restaurants and cafes, printing and publishing and auxiliary transport services. Foreign ownership is capped at 49% for air transport services, maintenance of road transport and maintenance of broadcasting equipment. Foreign participation is not permitted in passenger or freight road services, quarrying for construction materials, security services and real estate services, except in a few cases with government approval. Aqaba Special Economic Zone Authority (ASEZA) Investors in Jordan benefit from a wide range of 'development areas', special economic zones (SEZs), industrial zones and free zones, all of which offer a variety of incentives, benefits and tax breaks for both foreign and domestic investors based within them. The main SEZ in Jordan is located at Aqaba, covering the entire Red Sea coastline of the country as well as an international port and airport. The SEZ is intended to encourage private sector involvement in Jordan's economy, with the 20-year strategic plan launched in 2001 aiming to channel 50% of total investment into the tourism industry, 30% in services, 13% in heavy industry and 7% in light industry. In order to achieve this, a number of incentives are offered, including financial benefits, no caps on foreign ownership and no controls over capital flows and foreign currency purchases, while streamlined immigration procedures are available, as well as a range of logistics options, including excellent access to key maritime trade routes and well-established transport infrastructure. Free Zones located at: Zarqa, Sahab, Queen Alia International Airport, Al-Karama, Al-Karak Free zones offer non-fiscal benefits, such as logistics services, as well as exemption from income tax on profits accrued from exported goods, exemption of employees' salaries from income and social security tax, waived customs duties, and lifted property taxes. This vast incentive and SEZ development programme has not only encouraged FDI in Jordan, but contributed to the emergence of industrial clusters, which support growth of key industries and will further attract foreign investors to the country. There is, however, a risk that tighter fiscal policies, in line with the IMF's Stand-By Arrangement, will result in some of these generous incentives being reined in as a cost-cutting measure. Since July 2017, the Jordanian Tax Authority will not accept cheques or cash for any due tax payment above JOD5,000. Instead, the payment must be done through the online payment portal (E-Fawateercom), which can be accessed through internet banking services provided by local banks in Jordan. In 2018, this threshold was reduced to JOD3,000 and in 2019 it will be reduced to JOD1,000. Since 2018 all sales tax and income tax returns must be submitted using the online portal. Property Taxes It was paid annually and determined by the municipality according to the location and size of the property, and the annual rental value if it is a building. Transfer of property is subject to tax totalling 9%. Social security contributions Social security contributions levied on monthly salaries at a rate of 14.25% for the employer and 7.5% for the employee. The contributions should be reported and withheld by the employer. Work permits are valid for up to one year and may be renewed. The foreign worker must apply for a new permit if they wish to change jobs in Jordan. There are a number of barriers to employing refugees in Jordan, hindering integration into the labour market. The most notable obstacles include the cost of work permits and the difficulty for refugees to obtain the necessary documentation. 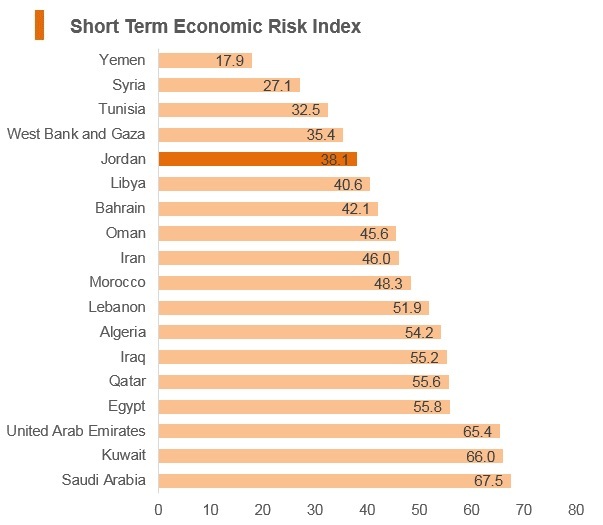 Jordanian nationals are also favoured for employment by law due to high levels of unemployment in the country and the risk of social unrest. Some measures have been introduced to ease the recruitment of refugees, including waiving permit costs and allowing companies in export zones to employ 25% of their workforce as refugees. In addition, the Jordanian government agreed with the EU to open the labour market in Jordan to the massive Syrian refugee population (1.3 million registered but estimated to be more) in exchange for USD2.1 billion in grants and USD1.9 billion additional financing from 2016 to 2018, as part of the Jordan Compact Agreement in February 2016. As a result, issuing work permits for Syrians is being made easier, especially in low-skill sectors, such as construction and agriculture. This has consequently widened the pool of labour available for recruitment and reduced compliance risk associated with employing refugees. The government also opened its first job centre in a refugee camp in August 2017, making it much easier for refugees to register for work permits and helping further to integrate them into the labour force. Under the Jordanian Labour Law, certain professions and occupations may not be filled by non-Jordanians, such as those in the fields of medicine, engineering, teaching, accounting and administration, as well as clerical work such as data entry and secretarial, warehousing, hairdressing, and mechanical and car repair type of work. 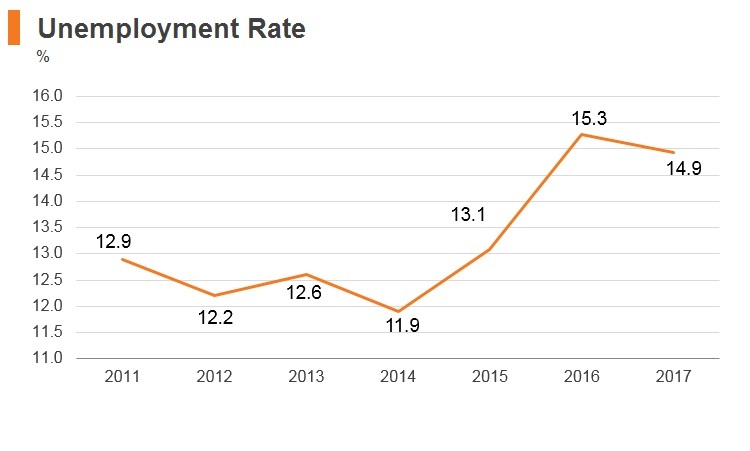 While there is considerable slack in the Jordanian labour market, an absence of vocational or educational skills in these areas means that businesses will face difficulties filling vacancies and higher training costs. Individuals of all nationalities must apply for work and residency permits if they want to work in Jordan, with priority given to Arab nationals. Work and residency permits are issued with the approval of the Ministry of Labour and the Ministry of Interior. An applicant may not begin working in Jordan before obtaining work and residency permits. Work and residency permits may not be transferred from one employer to another; therefore, if an employee changes employers, the previous work and residency permits must be cancelled, and the employee must apply for new work and residency permits. The work and residency permits are valid for one year and may be renewed on an annual basis. As a prerequisite to obtain work and residency permits, the Ministry of Labour requires the employer to submit a bank letter of guarantee to the order of the Ministry of Labour for each expatriate employee seeking work and residency permits in Jordan. 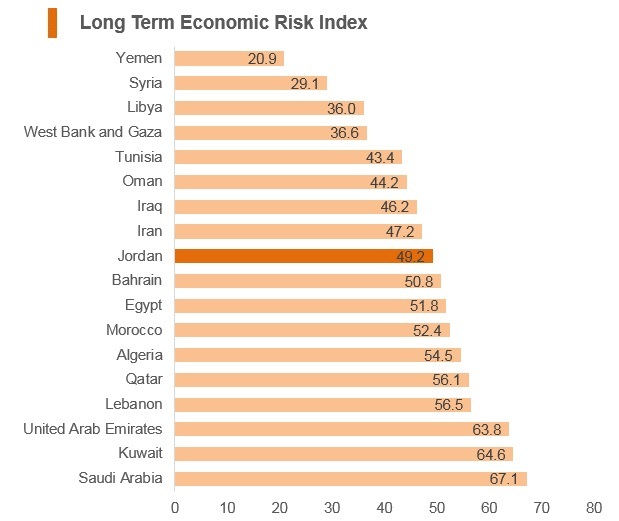 Regional instability stirred up by the ongoing wars in Iraq and Syria has had a detrimental impact on the Jordanian economy. In particular, tourism has suffered heavy losses as the risk of instability has dented the region's image abroad. 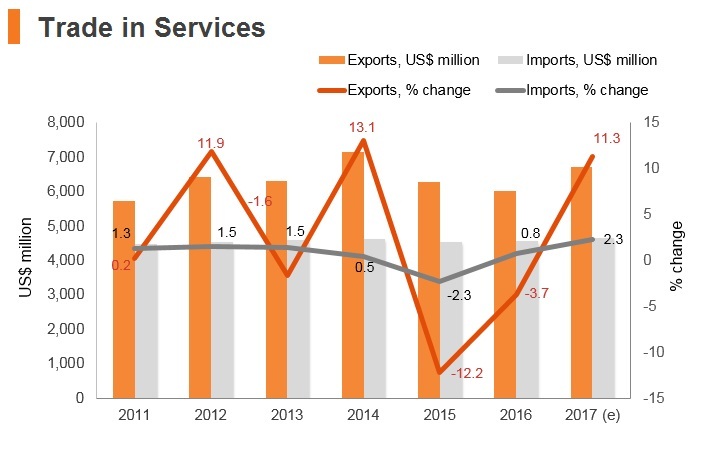 Instability has also led to the export sector being severely hit by trade disruptions in the region. That said, economic activity is expected to strengthen on the back of a gradual pick-up in exports. 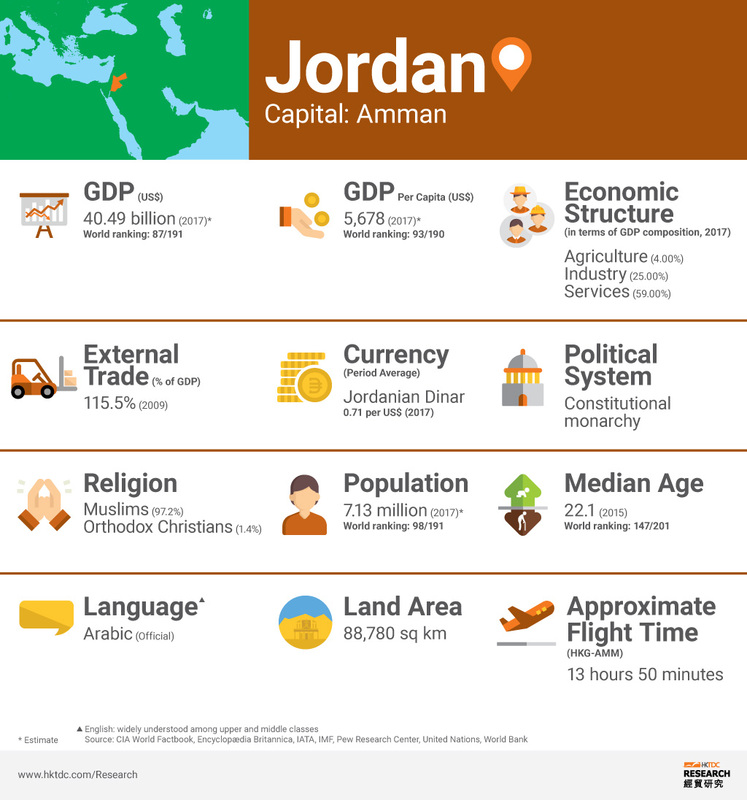 Jordan is one of the more prosperous and stable countries in the MENA region, owing in large part to its pragmatic foreign policy and close relationship with neighbouring states, along with strategic allies such as the United States. 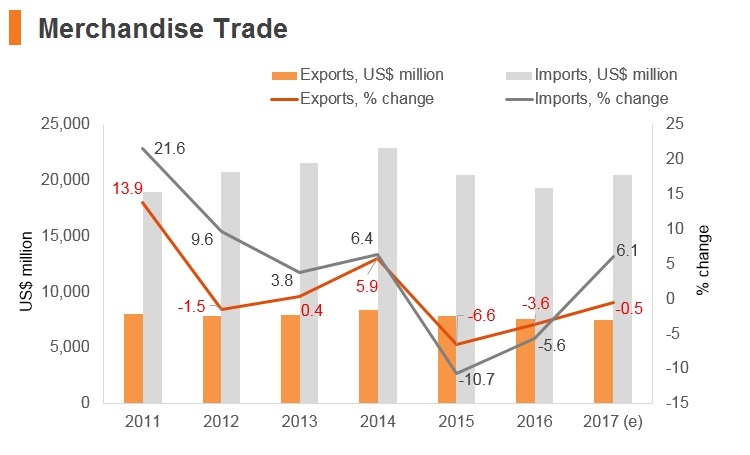 Progressive trade and investment policies, a strong logistics network and a large, slack labour market, offer considerable advantages for foreign investors. However, Jordan's proximity to several conflict hotspots, such as the West Bank, Lebanon, Syria and Iraq, has caused significant issues, notably with regard to supply chain disruption, a high influx of refugees, a growing import burden and severe pressure on public services. The Arab Chamber of Commerce and Industry (ARABCCI) was established in Hong Kong in 2006 to promote commercial ties between Hong Kong, the People's Republic of China and the Arab World. ARABCCI began with eight founding member companies and has evolved to include an ever-growing number of members. ARABCCI is run by business experts for business professionals, dedicated to opening trade opportunities by providing extensive information and professional services to members. Hong Kong citizens travelling to Jordan can apply for a free 30-day tourist visa.